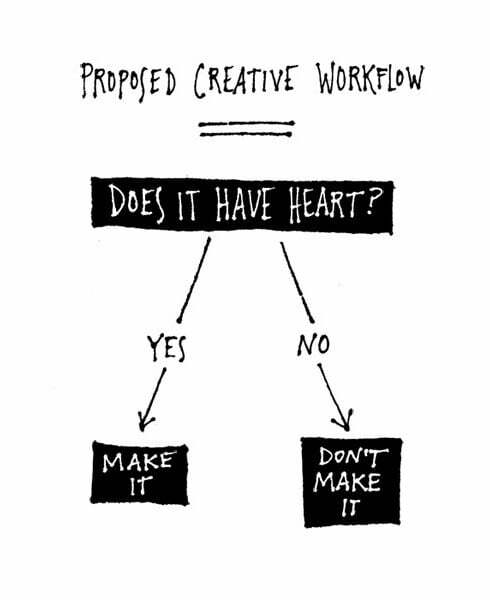 Should your creative idea be executed or not? Ms Swissmiss found a pretty good answer to that question on Frank Chimero’s, designer, illustrator and tinkerer from Missouri, USA, website. This is a very simple idea, but when designing it doesn’t fall under a yes or no answer. The better one can visualize and express that visualization the better you can get feedback for it. While inspiration in the making is helpful, when doing something for a customer this will often cause anxiety because they don’t know what you are doing, and haven’t approved of it. Bad things happen when you turn in something that you feel good about but the customer doesn’t. Make sure that you keep your heart in all of the project not just certain parts. Projects can often be long, returning to the creative process by organizing will help you keep your head and your heart in the game as the piece progresses. In the beginning there may be resistance to try or use some ideas. Should you follow your heart? A simple yes or no may not be the answer, because you may be at the Resistance stage of the creative process? What if you loose your passion? Incubation and Illumination often occur when you are doing something other than the project. This lets your brain works out the problem in the back ground. Mowing the lawn always helped me come up with those “Eureka” moments. Listening to your heart is often subjective; without being able to express ideas visually in the beinning the designer has the ability to withhold the opinions of others. The closer we are to the completion stage the more we must pick and choose our battles when working in a team. Think about what we love, hate, and can handle loosing. Can we or others replace it with something better? When looking at our feelings we also have to consider if we are settling? If we have lost our motivation and just want to finish the job, how can we get re inspired enough to make it right? Most importantly, is that time spent included in your budget.